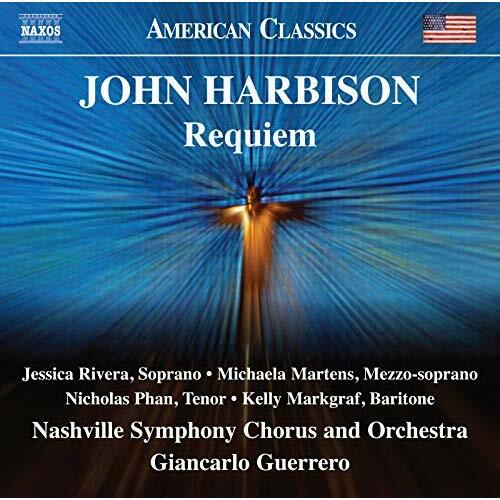 John Harbison’s Requiem Mass had a long and fragmented gestation, but it certainly sounds of a piece. 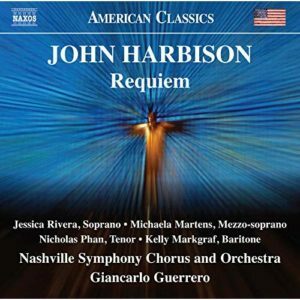 This debut recording by Nashville Symphony Chorus and Orchestra, led by Giancarlo Guerrero, emphasizes the contrasts between hushed reverence and explosive drama that make the work an exciting and vital addition to this well-populated genre. Harbison’s fluid orchestration and deft vocal writing are fully in evidence here. Despite his deep catalog, Requiem is one of his most compelling compositions to date. Charles Fussell was a professor at Boston University and UMass Amherst before moving to New York. His works were long a vital part of the musical fabric of New England. 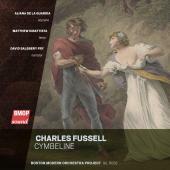 With BMOP’s new recording of his 1980s adaptation of Shakespeare’s Cymbeline, It is pleasing to see that they still are. This is one of the first pieces in which Fussell incorporated the Neo-romantic style for which he is best known today. In addition to winsome soloists soprano Aliana de la Guardia and tenor Matthew Battista – both taking on multiple roles – Cymbeline also prominently features bagpipes, adding an element of Celtic exoticism. Composer Jörg Widmann’s most ambitious score to date, this live performance of Arche, a secular oratorio spanning two CDs, is an affecting paean to peace. It was composed to celebrate the opening of the new Elbphilharmonie Hall. With texts ranging from Nietzsche to Francis of Assisi, it is both thoughtful in its connection of disparate ideas and stylistically diverse yet musically compelling throughout. Under Nagano’s leadership, the musicians give a compelling rendition of this challenging piece – indeed, it is hard to believe it is an unedited live performance. Arche’s climax, in which a children’s choir rebukes their parents’ generation for its destructive ways, is the most moving use of children’s voices I have heard since Terry Riley’s pieces for the Young People’s Chorus of New York City. Gil Rose directs the Boston Modern Orchestra Project, or BMOP. The orchestra’s in house label, BMOP/Sound, has released a spate of vital CDs of American music. I recently interviewed Rose about recordings already released on the label and a preview of the rest of 2018’s live and recorded events. In recent years, BMOP has released several recordings that “crossover” into pop, what some writers have described “Indie classical.” Which of these projects do you think have most effectively helped the ensemble to grow musically? Do you approach conducting differently when a groove supplied by a rhythm section or drum kit is part of the proceedings? Several projects come to mind including Eric Moe’s Kick and Groove both discs we did of Evan Ziporyn’s music and Tony Di Ritis Devolution. I think that when you have a “kit” involved listening is at a premium. At that point its important to share the stage with the drummer and try not to be a groove buster while keeping all the proceedings together. I think there is a lot of trust in the orchestra which empowers the players. That always brings out their best. I think we saw this at its best in our recording of Mackey’s Dreamhouse. I found BMOP’s Wayne Peterson recording to be fascinating, both because theIre isn’t a comparable disc of his orchestra music and because of the history of his Pulitzer prizewinning piece “The Face of the Night, The Heart of the Dark.” At the time that he won the award, there was some controversy because Ralph Shapey was one of the other finalists and was told his work was rejected in the finals after being recommended by the music subcommittee. He got mad and was very public about it. Listening to the two pieces, they are certainly different but are in the same pocket, relatively speaking: One wonders what all the fuss was about Peterson winning. Did you two discuss the Pulitzer situation at all or do you have any insights? I never have discussed the Pulitzer “incident” with Wayne. I think the piece is a knockout all by itself. It’s those American orchestral “Tone-Poems” that was likely to be forgotten in spite of the Pulitzer history. Robert Erickson’s Aurorus in the same ilk. There are MANY others. Great works that have been left behind because they require a virtuosic orchestra to pull off but major American orchestras are unwilling to take them on for reasons that personify the stagnation of our orchestral culture. Paul Moravec’s ‘secular oratorio’ seems to share an affinity with some British pieces in a similar vein: Tippett and Vaughan Williams, for example. Was that on your mind at all when preparing the piece for recording? Congratulations, by the way — it seems like a very challenging work — tough vocal parts as well as an ambitious orchestration — and BMOP/NEC pulled it off without a hitch. I think you are right to point out the connection to English Music. Though the piece is written for full orchestra it relies primarily on the strings. It gives it a sheen that makes it very exposed for the singers. Also the the vocal writing is tricky because the tonality is extended in the direction of chromatasicm which makes the tunig hard for the singers while they still have to sound lyrical. The subject matter is a challenge as well. The piece luckily (through clever design) has a few lighter moments as well as a good bit of hope to go along with the considerable pathos. For Innova, BMOP and you recorded Ann Millikan’s “Symphony,” which deals with someone close to her battling cancer? Will you please tell us a little more about the impetus for this piece and the way in which you interpreted its very personal story? Ann approached BMOP about making a recording of what for her was a very personal work. We were honored that she thought of us. Although the piece is dedicated to, and about someone who died, it actually is more of a portait of his interests and activities. It sort of functions as a celabration of his loves and life. I tried to bring out the character of each movement and how they related to the subject. Del Tredici’s Child Alice is one of an extensive series of his pieces that are based on Lewis Carroll? How do feel that his take on the stories of ‘Alice in Wonderland’ and ‘Alice Through the Looking Glass’ are inhabited in the music of “Child Alice?” What did you do to prepare yourself and the musicians for dealing with the particular sound world and quirky expressivity of the piece? I think the Alice stories and characters gave David the chance to deal in a kind of deep psychological exploration while at the same time show his sheer showmanship. His understanding of how music works at technical and sonic level when married his great sense of theater and sheer insanity creates an experience that you can’t prepare for. All I told the players was buckle up as your about to go several Rabbit Holes at the same time. Looking ahead to 2018, what are some of the recordings and activities to which BMOP listeners can look forward? In 2018 we have a full slate of concert and releases. We did a tribute to Joan Tower in February, In April were world premieres by Lei Lang, Anthony Di Ritis, Huang Rou followed by performances at the Library of Congress and June in Buffalo. Upcoming releases include works by Charles Fussell & Peter Child the complete orchestra works of Leon Kirchner, a great Chen Yi CD and Tobias Picker’s Fantastic Mr. Fox and a few other surprises. Information about BMOP’s first Fall concert is below. Composer Wayne Peterson (b. 1927) served as one of his generation’s fixtures on the West Coast music scene where, in addition to several other academic appointments, he elevated the composition program at San Francisco State to prominence. Despite fine recordings of his chamber music, this is his first portrait disc of orchestral music. 2017 has been a year where Boston Modern Orchestra Project, under the inspired direction of Gil Rose, has released a number of fine recordings, including CDs of works by Paul Moravec, David Del Tredici, Stephen Hartke, and Jeremy Gill (more about these in a forthcoming article). All are worthy of recommendation, but it is the Peterson disc that sticks out for me, both in terms of filling in a gap in late Twentieth century repertoire, and in the considerable durability of the works it contains. Transformations (1985), which resembles a concerto for orchestra, is a marvelous display of timbre, with recurring fanfare-like gestures of repeated notes and chords, punctuated by interjections from percussion, juxtaposed against solo passages and richly overlaid ensembles for each of the orchestra’s sections. Frequent changes in demeanor create an almost kaleidoscopic effect. While the playing is excellent all around, pianist Linda Osborn deserves kudos for tackling a formidable part. 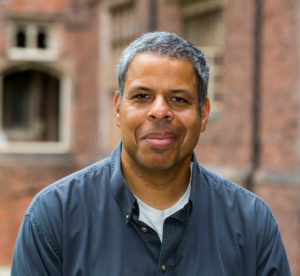 Jazz played an important role in Peterson’s development as a composer. There are jazz influences in all three of the pieces presented here, none more so than And the Winds Shall Blow (1994), a saxophone quartet concerto. PRISM Quartet are the estimable soloists here, often playing ensemble passages with such precision and fluidity that they sound like a single mega-instrument. The saxophone solo passages are where the flavor of jazz most keenly persists, and all of the PRISM members play them displaying a strong sense of jazz history, appropriately inflecting each successive homage to swing, bebop, and modern styles. In other places, quartet and orchestra alike are filled with contrapuntal intensity. Rose balances the many competing elements, artfully complex, and assures that each line receives due clarity. Peterson won the Pulitzer Prize in 1992 for the last of the selections on the BMOP disc, The Face of the Night, The Heart of the Dark, but this honor was not bestowed without controversy. Ralph Shapey had been tipped off early that his piece was the music jury’s recommendation, and raised hell when Peterson was selected over him by the board. After many years with only Shapey’s score to consult, I was grateful to finally acquaint myself with the Peterson piece and judge for myself (The Face of the Night… was played only once and a commercial recording wasn’t released at the time – nor has Shapey’s been recorded commercially. In fact, it would be wonderful if BMOP turned its attentions to Shapey on a future portrait CD – they would play his work just as eloquently as they present Peterson’s). As a Shapey scholar, and based on some of the press I had read about the debacle, I’ll cop to a bit of bias: I had presumed that his Concerto Fantastique would win handily: I’m happy to admit that I was wrong. Both are excellent compositions. The Face of the Night, The Heart of the Dark is expressive and labyrinthine in form where Concerto Fantastique is taut and sectional, but both display a compelling, complex harmonic language and masterful use of the orchestra. Face of the Night… is cast in two movements. The nocturne form is given a modern treatment not unlike the insomniac reveries of Elliott Carter’s Night Fantasies. Rapid shifts in demeanor betray the stray thoughts that sometimes keep us from sleep or inhabit our dreams. Peterson’s Face of the Night, The Heart of the Dark has passages that underscore the portentous quality suggested by its title. However, all is not nightmarish: there are beautiful moments of repose and reflection that suggest the coming darkness is not entirely enveloping: dawn awaits. The work’s climax is stirring and resolute – one imagines bolting upright from bed. Transformations is Sequenza 21’s Best Orchestra Portrait CD of 2017. Virgil Thomson’s 1934 collaboration with the eminent author Gertrude Stein resulted in their first of two operas, Four Saints in Three Acts. Boston Modern Orchestra Project, conducted by Gil Rose, has made successful forays into recorded opera before, bringing scores such as Lukas Foss’s Griffelkin and Charles Fussell’s Wilde to life. Their recording of Thomson/Stein’s opera is a very successful addition to the orchestra’s burgeoning catalog of works. Taking Stein’s use of non-linear narrative in her writing as a cue, Thomson created a score that, for its time, was exceedingly adventurous. At first blush, one might well think of Thomson’s harmonic language – relentlessly tonal – and his borrowing of material from the American vernacular – ranging from hymns and folksongs to popular songs and dances – to be far more conservative than Ives or other contemporaries who mined similar material but with a more dissonant palette. There is also a component of repetition and scalar melismas, even counting that sounds like a cousin of passages in Philip Glass’s Einstein on the Beach, that suggests a proto-minimal approach to Thomson’s design. However, near-constant shifts of texture and demeanor, which mirror Stein’s approach to text, provide their own set of challenges for both musicians and listeners: in essence, how to follow the thread? Four Saints in Three Acts is a work with a large cast, yet all of the roles in BMOP’s production are populated by fine singers, many of whom are associated with the Boston area’s various operatic ventures. The orchestra’s playing under Rose is also exemplary: this is a score in which frequent changes of instrumentation create a balancing act that could undo a lesser ensemble. The liner notes are well curated. 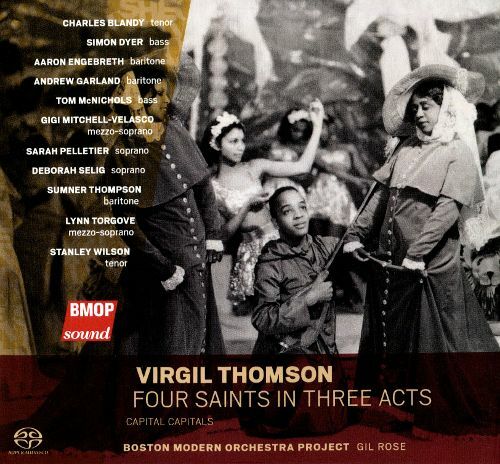 Given his totemic role as a writer on music, including Thomson’s essay about Four Saints is a particularly nice touch. Thomson scholar Steven Watson contributes his own enlightening essay, underscoring the durability of the opera through many production incarnations, from its original — an all African-American cast (most unusual for its day) — to Robert Wilson’s staging for huge animal costumes. Capital Capitals is another Thomson/Stein collaboration, this one from 1927, for four male voices and piano. The text discusses the various virtues of “capital cities” — Aix, Arles, Avignon, and Les Baux — in Provence (Stein became acquainted with the region during her tenure as an ambulance driver in the First World War). It is breezier than Four Saints and proves an eminently charming counterpart. At 8 PM on Friday, March 31st at New England Conservatory’s Jordan Hall, BMOP presents a concert featuring works by John Harbison, Eric Sawyer, Ronald Perera, and the world premiere of BMOP commission Black Noise by David Sanford. Soloists include violinist Miranda Cuckson, cellist Julia Bruskin, and pianist Andrea Lam. At 7 PM, a pre-concert lecture with the composers will be lead by Boston Symphony’s Robert Kirzinger. A repeat performance, this one with the Claremont Trio as soloists, will be at 3 PM on Sunday, April 2nd at Amherst College’s Buckley Recital Hall. 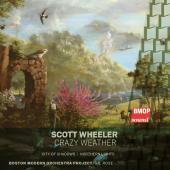 As evidenced by Crazy Weather, Boston Modern Orchestra Project’s latest recording of music by Scott Wheeler, the composer really knows his way around the percussive sounds. Even on pieces for strings like the title track, there is the ‘thwack’ of pizzicatos and bow slaps to help propel the proceedings. Pacing is another strong suit of Wheeler’s. The shadowy passages of City of Shadows are balanced by flurried gestures that enliven the music and help to articulate the work’s overall architecture. The outer movements of Northern Lights give the impression of intense and quicksilver slalom runs, while the middle movement, marked “Still and Granitic,” provides a portentous counterpart. 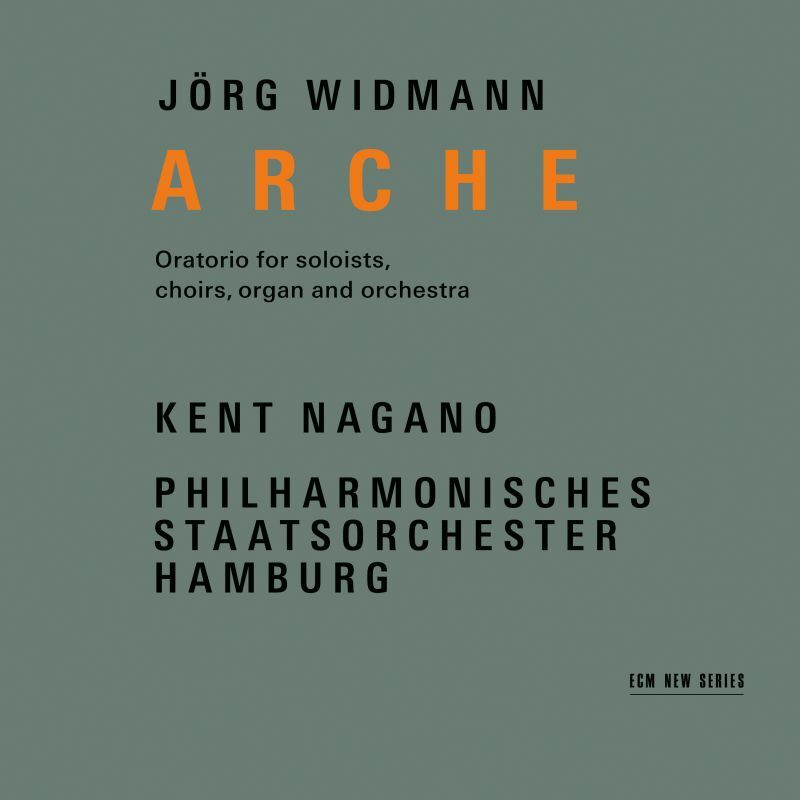 BMOP’s new digital release of two of Kirchner’s large ensemble works, Orchestra Piece (Music for Orchestra 2, 1990) and Toccata (1955) certainly lives up to Kirchner’s credo.